Click the image for ELA standards. Click the image for Math standards. 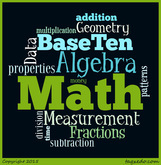 Click the image for the Standards for Math Practice. Click the image for Science standards. Click the image for SS standards.